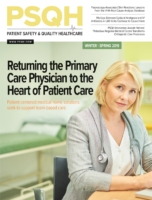 Editor’s note: The following is a lightly edited Q&A with Craig Deao, MHA, senior leader at Studer Group, on the role of patient engagement in care quality. PSMJ: How big a role does patient engagement have in care quality? Deao: It’s significant. I really view this as the missing variable that we haven’t sufficiently studied or acted upon. If you just think about how much time we emphasize on chronic disease for example, where it’s responsible for about 40% of the deaths in the U.S. and maybe 70%-80% of the costs. Those are largely preventable. We talk so much about improving quality outcomes but gosh, if we could prevent some of these conditions in the first place, wouldn’t that be great? And big levers of those are things like nutrition, and exercise, and not smoking. Which are directly a result of the behaviors and actions we take as people. The healthcare system can facilitate that. It can’t take the place of it, but engagement of the person is going to be critical for that. It all comes down to an individual’s choices and actions. So [patient engagement] has a role to play in quality, prevention, and certainly from an improvement and treatment standpoint. This is about whether the patient actually takes the medication, comes back for that follow-up appointment, adheres to the treatment advice, asks questions, makes informed decisions, all that. It’s a huge component of quality. This is an excerpt from Patient Safety Monitor Journal. Subscribers can read the full article here. Find out more about the journal, it’s benefits, and how to subscribe by clicking here.